Shown is a sea pen. Bioluminescence — the ability of some living things to generate their own light — occurs on many branches of the tree of life. This pane of 20 stamps showcases 10 examples of Bioluminescent Life. Although these stamps do not glow in the dark, they do incorporate a special effect. The stamp pane was produced using a proprietary rainbow holographic material that is highly reflective in white light. 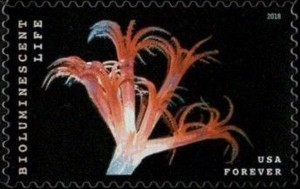 The stamps were produced using special techniques to enhance the reflective qualities of the material while maintaining the depth of color and detail of the individual images. The rainbow pattern imparts a sense of movement and light to the stamp pane. Fairly rare among species on land, bioluminescence reigns supreme in the darkness of the deep ocean. Fishes, squids, jellyfish, worms and many other ocean organisms make varied use of their ability to glow. Their light can lure food, attract a mate or fend off a predator. For many species, bioluminescence is security lighting. For example, the midwater jellyfish — featured on one of the stamps — sets off flashing swirling rings of light when threatened. The display alerts other predators more likely to eat the attacker than the jellyfish itself. Some species are born with bioluminescence, while others, like certain fishes and squids, have receptacles for displaying bioluminescent bacteria that they capture. Since the late 19th century, many breakthrough discoveries regarding bioluminescence have come through the study of fireflies and flickering beetles. Because these beetles exist on every continent except Antarctica, they provide scientists with the most convenient means by which to investigate the phenomenon. Medical science has benefited tremendously from the study of luminous life-forms. Using genes that enable bioluminescence, scientists can make a cancer cell glow, enabling observation of how the disease behaves and spreads. Similar research is also vital in the fights against Alzheimer’s, Parkinson’s, anemia, malaria, dengue fever, HIV and many other illnesses. Through improved deep-sea exploration and advances in photography, scientists have identified thousands of bioluminescent species. Yet many mysteries of bioluminescence remain unsolved, and many benefits of research await discovery.